With few weeks to the expiration of the tenure of office for the President of the Nigerian Bar Association (NBA); Mr A.B. Mahmoud SAN, the time has come to vote among others, the next President of the Nigerian Bar Association and in accordance with the internal zoning arrangement of the Association, the position of the NBA President has been zoned to the Eastern part of Nigeria comprising of Rivers, Akwa Ibom, Cross River, Abia, Anambra, Enugu, Ebonyi and Imo States. This report examines and compares the respective profiles of the 4 (four) candidates, thereby allowing lawyers, the opportunity to independently vet & select the most capable to lead the Bar. These 4 candidates include Mr. Paul Usoro, SAN, FCIArb; Prof. Ernest Ojukwu, SAN; Mr. Arthur Obi Okafor, SAN FCIArb and Mazi Afam Osigwe, LLM, FCIArb. Also the information contained in this report has been sourced from the profiles independently released to the public domain by these candidates. It is trite that the President of the Bar Association must not be selected merely by whims but by careful examination of the Candidates. 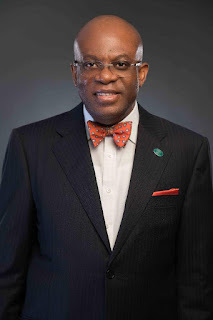 The next President of the NBA must have the qualities of an exemplary leader and a rich background of legal advocacy and competence; he also must be honest; have a passion for the welfare of lawyers and quite knowledgeable in corporate governance. It is also most important the next president of the Bar understands finance and how to open Nigerian lawyers to more international and local opportunities. The big question however remains “who is the right candidate to lead the Bar Association? 1. Born on 07 September 1958. 2. Bachelor of Laws, 1981 from the University of Ife, Ile-Ife (now Obafemi Awolowo University) Osun State, Nigeria. 3. Called to the Nigerian Bar in 1982. 4. Senior Partner and founder of Paul Usoro & Co (PUC). 5. PUC is a top commercial law firm founded in 1985 in Kaduna. Now headquartered in Lagos with offices in Abuja and Uyo. 6. Firm employs over 38 lawyers excluding corpers. 7. Notary Public from 23 June 2003. 8. Heads the Advocacy and Dispute Resolution Practice Group and the Communications Section of the Firm. 10. Elevated to the Inner Bar as a Senior Advocate of Nigeria in 2003. 13. Actively participated in the activities of the Nigerian Economic Summit Group. 14. Paul was Awardee of the Corporate Governance Rating System (GCRS) “Rating Certificate” by the Board of the Nigerian Stock Exchange and The Convention on Business Integrity. February 2018. • Finance and Accounting for the Nonfinancial Executive, Columbia Business School in New York, USA (March 2018). 1. Born on September 23 1960. 2. 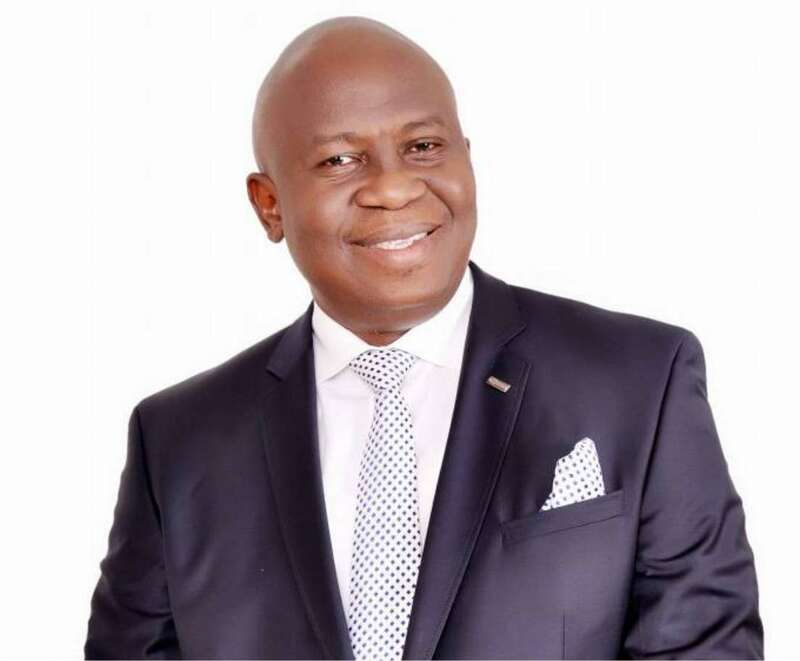 He attended the Methodist College, Uzuakoli and Government College, Umuahia. 4. Called to the Nigerian Bar in 1984. 5. Elevated to the Inner Bar as a Senior Advocate of Nigeria on 12 July 2014. 6. In 1988, he established Eleuthera Chambers with his friends. 7. 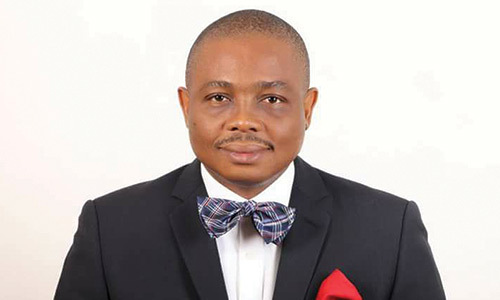 Former Deputy Director General, the Nigerian Law School, Augustine Nnamani Campus, Agbani Enugu. 8. Associate Professor and Dean Faculty of Law, Abia State University, Uturu from 1995-2001. 9. Partner at the Law Firm of Ojukwu, Faotu and Yusuf (OFY Lawyers). 11. 3 years of active law practice. 1. Born on the July 18 1965. 3. Secondary school education at St. Joseph’s Secondary School, Awka-Etiti in Anambra State where he obtained his West African School Certificate in 1981. 4. 1984, Ordinary Certificate in Business Administration at School of Accountancy and Business Studies, Uyo, Cross River State (an affiliate of Calabar Polytechnic at that time); now Uyo City Polytechnic in Akwa Ibom State. 5. Bachelor of Laws degree in 1990, from the University of Calabar. 6. Called to the Bar in 1991. 7. Established the law firm of Arthur Obi Okafor & Associates in 1995. 8. Elevated to the Inner Bar in 2010. 9. 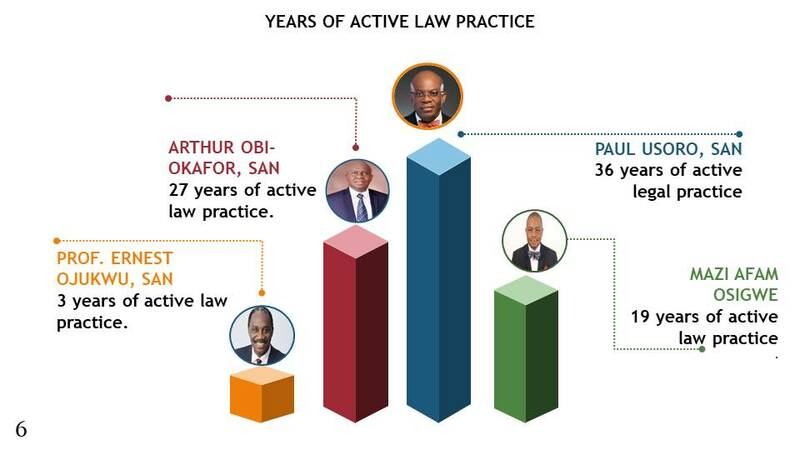 27 years of active law practice. 1. Born on 25 of October 1972. 2. Attended Dennis Memorial Grammar School, Onitsha. 3. Studied law at the University of Nigeria, Enugu and graduated in 1997. 4. Called to the Nigerian Bar in September 1999. 5. In 2002 founded his firm, the Law Forte (Legal Practitioners, Corporate Consultants and Notary Public). 6. Notary Public in 2006. 8. Master of Laws (LLM) from the Centre for International Legal Studies, Austria (in collaboration with the Lazarsky University, Poland). 9. Diploma in International Commercial Arbitration. 10. Fellow of the Chartered Institute of Arbitrators (UK) in 2011. 11. Fellow of the Nigerian Institute of Chartered Arbitrators in 2017. 12. Member, International Bar Association. 13. Member, Nigerian Institute of Management. 14. Associate Member, American Bar Association. 15. Member, Institute of Chartered Mediators & Conciliators. 16. 19 years of active law practice. Over the next few days, we would be sharing other comparisons between the profiles of the NBA Presidential Candidates. Kindly read, evaluate all contestants and share.